Even More Live Response Collection Updates!! Hello again readers! The last update to the Live Response collection was about two months ago, and I have been working on adding more open-source tools and data collection processes to the collection. I also tried to enhance the way that the Windows Live Response collection operates, including building in some file/location existence checking in an effort to ensure compatibility with newer version of Windows, including some initial attempts at gathering data from Windows 10, with many thanks going to Brad Garnett for doing testing on these newer versions. "This may be a significant portion of the total data, and most tools will extract this data stream to its full size (which is annoying and a huge waste of disk space). This is where this tools comes in, as it only extract the actual data for the change journal. That way extraction obviously also goes faster. Why extract 20 GB when you might only need 200 MB?" The script also now leverages another great data extraction tool, forecopy_handy. By using this tool, it also allows copying of in-use files such as Registry Hives, Event Logs, and browser related files from a live system. If you create a disk image using the "Complete" version of the script it is likely that you will get access to these files, but this method allows you to take the files prior to (or instead of!) creating a disk image if you would like. There are also many changes to the overall processing performed by the script, for example, before the script would delete the entire Registry folder related to Sysinternals, but Luca Pugliese pointed out that in some investigations you may very well be looking for when Sysinternals was installed on the system, and that method could very well wipe out evidence (which could potentially be a bad thing). The script now checks for evidence of Registry Keys related to the Sysinternals programs that the script requires. If it finds them, it updates the value to "1" (to ensure the tool will run without user interaction) and that is the only change that is made. If the key is not found, it will populate the required Registry keys, but it will still clean up after itself. Extracting the $MFT, $LogFile, and $UsnJrnl had always been in my plans (especially if you use the TriForce tool) but I just hadn't had the time to work on the updates until the past week or so. of the Internet — what’s good and what’s bad. brand new "zero-day" ones — and protect you." Naturally I was intrigued by this, although the cost of the tool (five dollars for five years) seemed to be awfully cheap, and I was a little surprised that the two options at the bottom of the screen are "Rest of World" and "Mainland China". My location options are "Rest of World" and "Mainland China". That seems a little odd. When I did a Google search for the company, I came across their Twitter account which, since joining in 2011, as a total of one tweet. That also seems odd, especially for a company that does as much business at the article states. Since February 2011, the company Twitter account has tweeted one time. Again, that seems odd to me. At this point I was a little concerned, and I decided to use a very low limit credit card that I seldom use, just in case I had any more bad vibes after making the purchase. 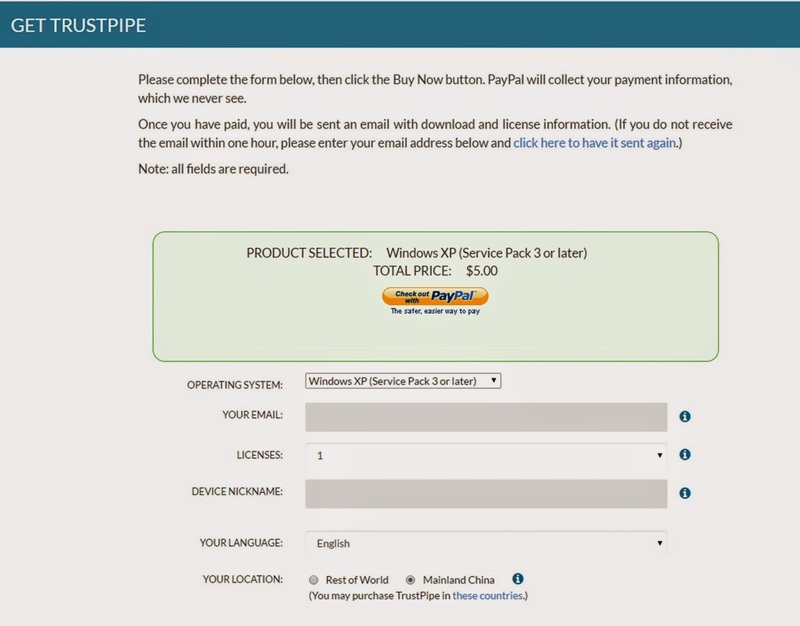 I paid the five dollar cost and received an email to download the tool. The instructions seem fairly straight-forward, and I downloaded the tool. I transferred the file to my Malware Box of Evil and I ensured that I had .NET 3.5 installed prior to the installation, just like the instructions stated. 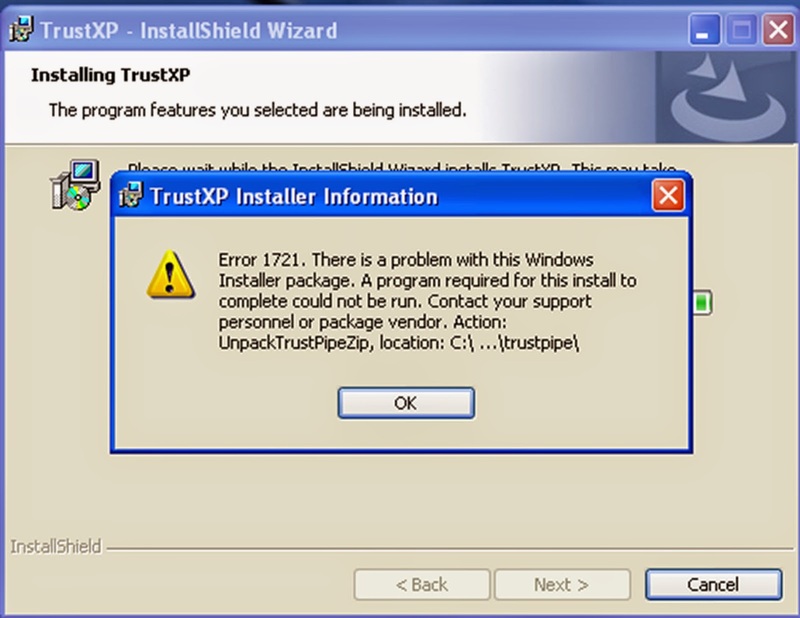 When I tried to install the program, I got an error message 1721 stating that there was a problem with the installation. I tried to install the application a few times before giving up. If there is an installation problem I would very much like to be told what the program that is needed would be, rather than a general error. I did a little bit of digging into the program with PEStudio and didn't see anything that jumped out at me as a warning flag, but then again, it is difficult to say without spending some time reverse engineering it, which I am not inclined to do at this point. The bottom line for me is that this product, which is supposed to be lightweight, easy to use, easy to install, etc. will not even install properly on the Malware Box of Evil, which is running Windows XP SP3. I don't see how a product geared towards specifically working on Windows XP cannot run/install properly on the box, but at least I am only out five dollars. 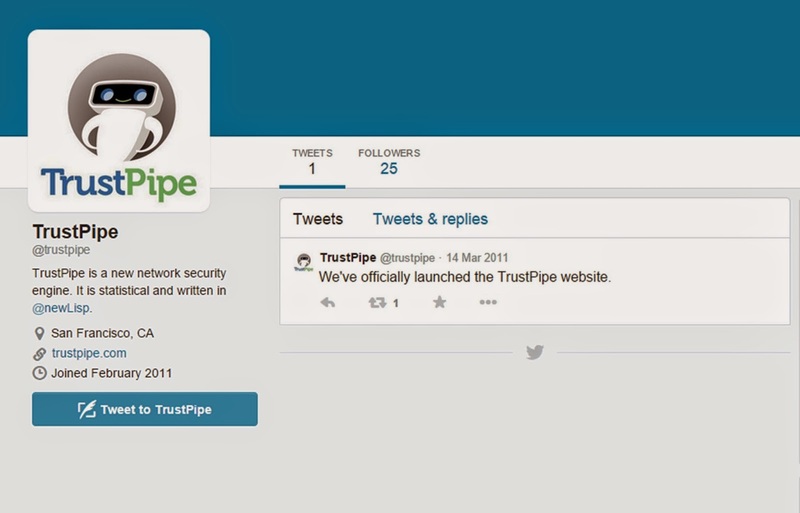 Their website is not very helpful and it does not have very much information, and browsing the LinkedIn profiles of their "Team" page on the website, it is hard to determine exactly who is employed by TrustPipe and who is not. I would love to hear from anyone who has actually used the product and am curious on their results with it. 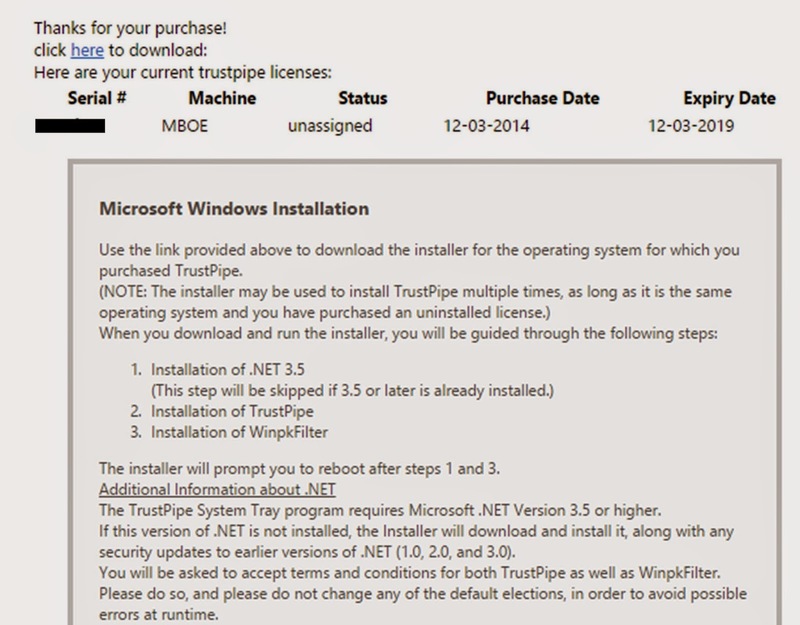 I was looking forward to testing some POS malware with TrustPipe running to see how it would fare, but due to the installation problems I don't even recommend getting the application for testing purposes. I also immediately called up my credit card company and cancelled the card that I made the purchase with. With the bad vibes that I felt going through the initial checkout process, I felt that it was best to cancel the card and request a new one, just in case.